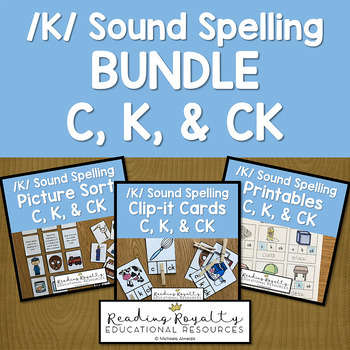 This bundle includes each of the /K/ sound spelling resources from my store. Purchasing the bundle offers a more than 20% discount on the regular value of these resources! Each of the resources in this bundle are also available individually. 56 clip-it cards. Each picture card has three boxes with the letters c, k, and ck. 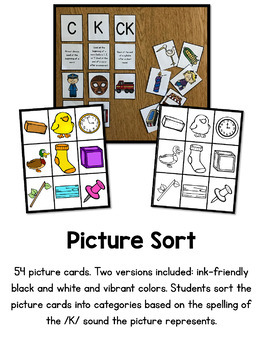 The object of this activity is for students to identify which spelling pattern fits with the picture card. Students can use clothespins, bingo chips, dry erase markers, etc. to mark their selections. 54 picture cards. 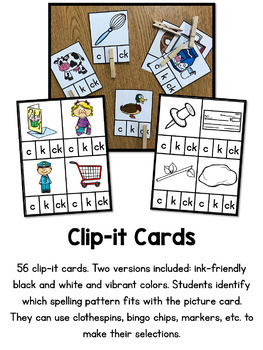 Students sort the picture cards into categories by the spelling of the /k/ sound the picture represents. Four different no-prep printables for spelling the /k/ sound with c, k, or ck. 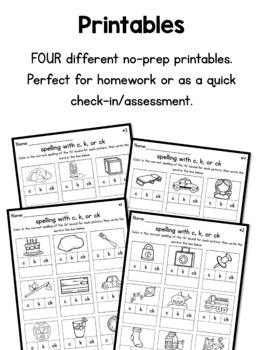 They are perfect for homework or as a quick check in/assessment! C, K, CK Clip-It by Michaela Almeida is licensed under a Creative Commons Attribution-NonCommercial-NoDerivatives 4.0 International License.